OPIS450 is an innovative tool that calculates the average price of middle distillates barges in the ports of Flushing, Amsterdam, Rotterdam, Antwerp, and Ghent at every minute of the day between 9:00 a.m. and 4:30 p.m. London time – 450 minutes. Live bids, offers and trades are fed through to OPIS through a trading screen from Trayport, a technology company owned by TMX Group Ltd of Canada. The effect of the OPIS450 is to capture peaks and valleys of oil volatility throughout the day, rather than just a single price at 4:30 p.m. London time. OPIS450 takes into account OPIS's well-known full-day pricing methodology while offering complete market transparency for anyone wanting to price fuel. The OPIS450 assessment makes middle distillates prices visible through the entire trading day. By using price averages, OPIS450 helps navigate through the spikes and troughs that are characteristic of volatile market trading. OPIS450 only assesses prompt loading barges. Learn more about OPIS450 methodology here. With a subscription to the OPIS450 Europe Jet Fuel Report, you will be able to monitor the barge jet fuel price in the more liquid Flushing-Amsterdam-Rotterdam-Antwerp-Ghent trading region, as well as the North Europe Cargo, Med FOB, and Arab Gulf jet fuel settle values. All combined with expert market commentary so you have a complete and transparent picture of the day's entire activity. 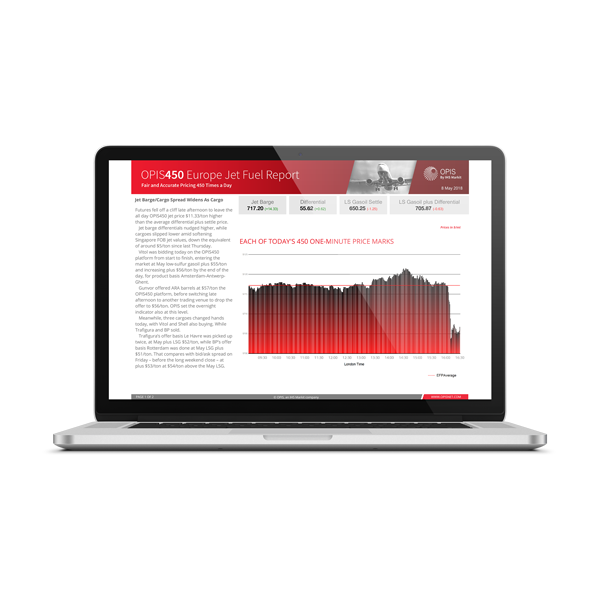 View a sample of the OPIS450 Europe Jet Fuel Report. Ship owners and brokers, fleet operators, bunker fuel traders and suppliers can take steps now to be ready for the tighter marine fuel regulations. This daily report provides a daily price assessment for diesel marine fuel type A (DMA), factoring 450 price marks each trading day to give you a fair and accurate price reflective of the day’s market activity. With a subscription to the OPIS450 Diesel Marine Oil Report, you will be able to monitor the dyed and undyed DMA barge value for the Amsterdam-Rotterdam-Antwerp trading hub each business day, as well as the market's high-sulfur fuel oil number and low-sulfur gasoil settle. All combined with expert market commentary so you have a complete and transparent picture of the day's entire activity. View a sample of the OPIS450 Diesel Marine Oil Report. Read the OPIS450 Europe Jet Ticker fact sheet. "KLM uses OPIS450 because it means new choice for airlines." 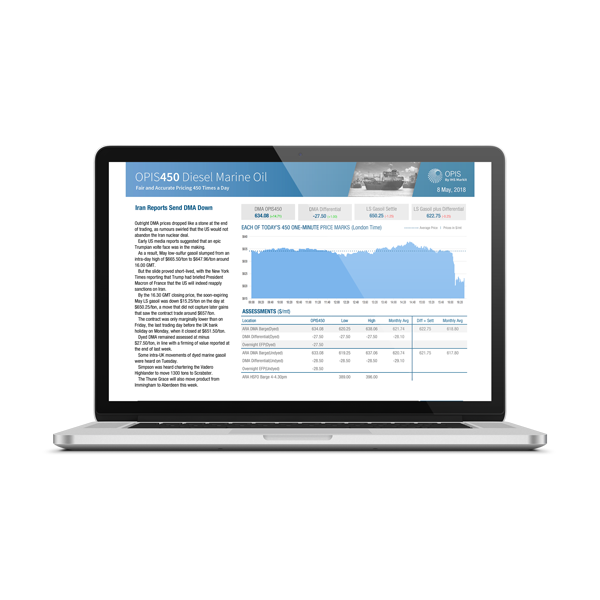 "OPIS450 is a straightforward price that supports a more transparent daily price report." 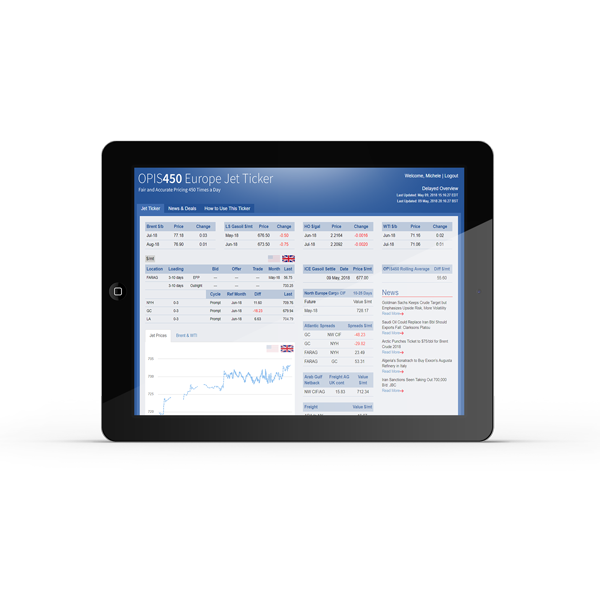 "OPIS450 shows us the market – every minute of the trading day."